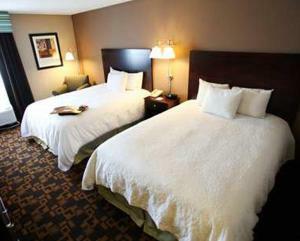 The Hampton Inn North Mobile/Saraland hotel is a three-story hotel located at Exit 13 of Alabama Interstate I-65. Local area attractions include the USS Alabama Battleship Park shopping district golf and tennis. The entertainment and restaurant districts are 8 miles from the hotel. This Hampton Inn hotel in north Mobile Alabama has inside corridors decorated in contemporary colors of mauve and greens with light cherry furniture to reflect the southern charm of the Gulf Coast. We love having you here at the Hampton Inn North Mobile/Saraland hotel in Alabama.